We offer a comprehensive range of sub floor ventilation system services and solutions. What is Sub floor ventilation? Research has proven that people get sick from dampness underneath floors. 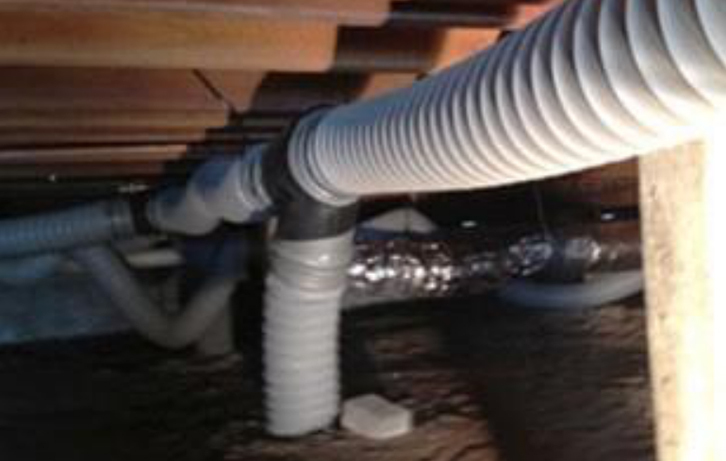 The solution in many cases is to install a sub floor ventilation system. If the sub floor is damp, termites will be attracted, flooring will become cupped and the integrity of foundations may be compromised. If left untreated, there may be a health hazard for the occupants. Excessive sub floor moisture may cause problems. The most common problems are rising damp, wood rot, pest or termite infestations and unpleasant odours. If untreated, this could lead to the formation of mould, mildew which may lead to serious health issues. Mould isn’t just an unsightly problem – it’s a serious health risk. We can help you prevent all this, by installing a sub floor ventilation system to remove ground moisture from underneath raised floors which is an affordable, economic and long-lasting solution. One of our expertly trained technicians will generally complete the installation of a sub floor ventilation system in under a day. Our technician will ensure the system is operating effectively and reducing the excess sub floor moisture thus beginning to fix your rising damp problems. 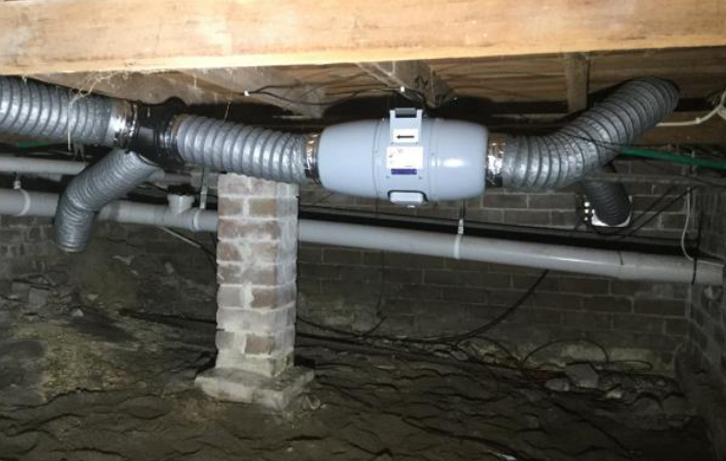 The system is designed to exhaust dampness trapped from the air from the sub floor and introduce fresh air in through existing or new passive vents. 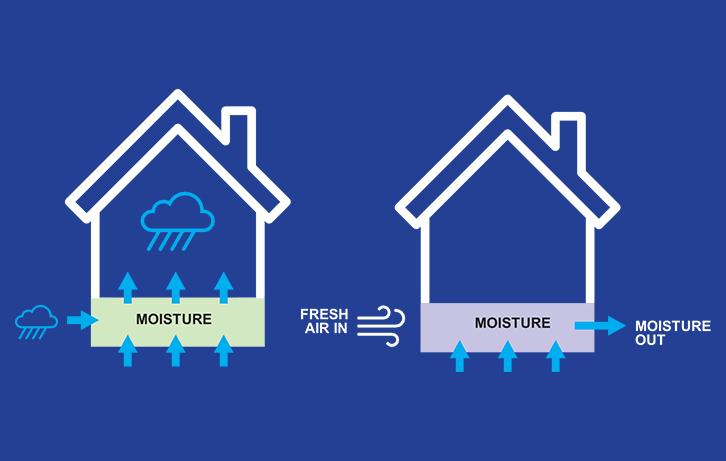 It works from drawing in fresh air from one side of your home (external), circulating the new fresh air which pushes the stale air towards a damp air removal system on the other side of your home. The cross-flow ventilation from one side to the other creates air change through your sub floor and replaces the air up to 15 times an hour during daylight hours. The excessive sub floor moisture will no longer enter inside your home. 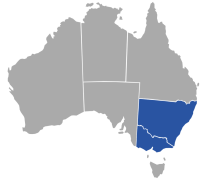 The Mould Doctor will create a healthy home and living environment for you and your family. The Mould Doctor carefully selected the Blauberg International line as our preferred sub floor ventilation system. Germany engineering, quality workmanship and the use of the latest technology equals a superior and reliable cost effective performance. The Mould Doctor uses the exclusive silent ventilation Blauberg ISO fans, Centro M, metal cased air pumps and smart fan models.